I have already shared a post on how to stitch a top with overlapping only in the upper part. 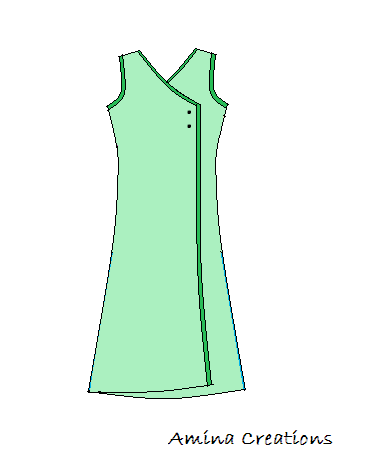 In this post the method of stitching a full overlapping kurti is discussed. Join 3 to 5 through a curve passing through‘d’ as shown. ‘a’ is the midpoint of 3 and ‘d’. Take ‘b’ ½” from ‘a’ and draw another curve from 3 to 5 through ‘b’ and‘d’. The inner curve through ‘b’ is for the front arm hole, and the outer curve through ‘a’ is for the back arm hole. 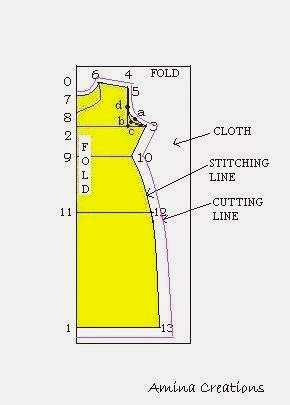 For stitching a full overlapping kameez, first measure and note down the body measurements. Now you will have 2 pieces, one for the front and the other for the back. Now to cut the cloth for the overlapping part, take the front piece and place it over the remaining cloth from which you have to cut the overlapping. You can use a cloth of the same colour or a different colour. Mark an outline using chalk and then take off the front piece. 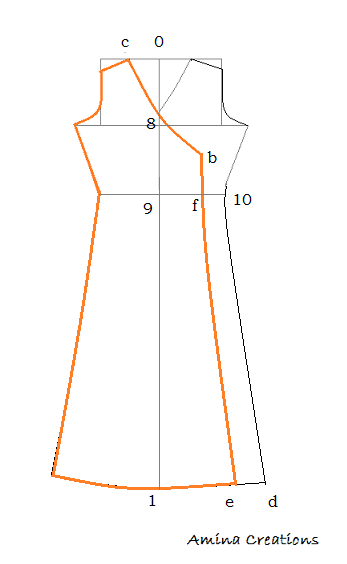 Mark the following measurements on the cloth. 10 to f = 3" or 4"
f to b = 2" or 3"
d to e = 3" or 4"
Join c to b through a curve passing through 8 and b to e passing through f. Once done cut the cloth leaving 1/2" along all curves and 1" along the side. Do a piping along the c to b and b to e curves. Once the overlapping piece is ready, stitch it to the front piece along the shoulder, arm hole and side. Now start by stitching at the shoulders and then finish the neck. For this refer FINISHING THE NECK. Then stitch short, long or puff sleeves to the arm holes. For the construction and method of stitching sleeves, check out their respective pages. Once the sleeves are cut, double fold the ends and stitch on top and then stitch the sleeves to the arm holes. Note that the front part of each sleeve will have a slightly deeper arm hole curve just like the front arm hole of the kameez. Once the sleeves are stitched to the arm holes, start stitching the sides starting from the ends of the sleeves and stopping at the opening at the sides. Check out STITCHING THE SIDES for more detailed explanation. Finish the bottom end by double folding the extra cloth and stitching. You can tie a draw string or stitch buttons near "b" to keep the overlapping cloth in place. 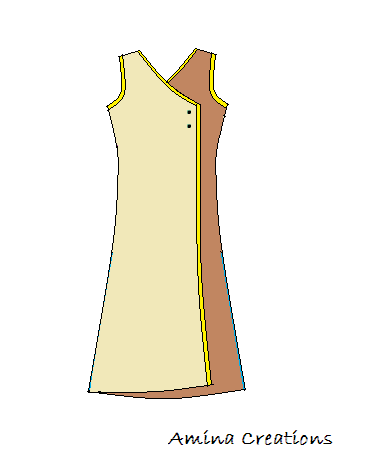 Turn the dress to the reverse and over lock the cloth to prevent threads from coming out. Your overlapping kurti is now ready. 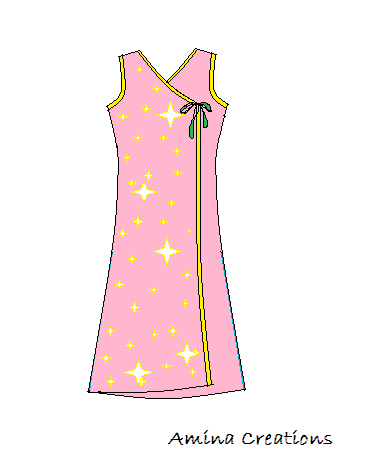 You can also stitch show buttons, or add beads and sequins to enhance the look of the dress. the overlapping piece can also be of the same colour or different colour. I have tried to explain the method as clearly as possible but it is advisable to use your discretion while stitching this kurti. If you are a beginner then you can start by stitching a basic kameez or kurti and then move on to other patterns. I was waiting for this, very detailed explanation. Thank you for posting. I will try to make this and let you know how it comes out.